It’s Sunday afternoon and yet again I’ve forgotten all the things that I was going to write about on this good old blog. 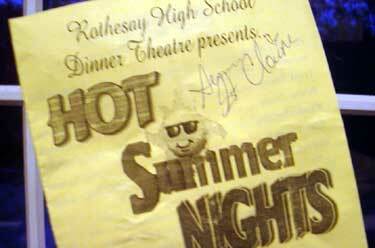 Last Friday Meghan and I went on a hot dinner date… with our parents… and saw the Dinner Theatre at RHS. I got Summer St. Claire’s autograph! Wooooo! She’s so hot. All night we were both coveting certain cast members (in our cougar like ways) and were disappointed when we saw them outside the theatre lighting. Oh poo. And, because I’m so cool and fun, I found this view of Verdun on the internet. That’s where I live! I can even point out my exact building. Technically, Google could do it for me, but I didn’t want to post my exact address on the internet… In the upper right corner of that shot you can even see the Verdun Circus School. I love my neighbourhood.